It is the end of the 24th Century and the Solar System shudders with the drums of war. 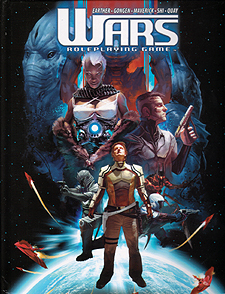 A rift in space has slashed across the system between the Asteroid Belt and Jupiter, and from this great wound in the universe have come invaders: the arrogant, wraithlike Shi and their enemies, the brutal Quay. But the rift brought with it something else... a strange quantum energy which has granted certain select individuals exotic powers, abilities never seen before in the history of humanity. The Shi and the Quay do not face a united human race. Centuries of exploration and expansion, of disaster and disagreement, of misunderstanding, greed and acrimony have split humanity into three distinct camps, each already at the others' throats when the rift changed the face of the Solar System forever. Five factions now war for control of the Solar System. The Earthers, ruled by giant corporations, the Gongen, descendants of those who fled the radiation-scarred wastes of Asia for the red sands of Mars, the Mavericks, pirates and rogues of the Outer Rim, the Shi, imperialistic and domineering, and the Quay, tribal, brutal and proud. This universe of conflict and power was introduced in the WARS Trading Card Game from Decipher. Now, you can step inside of it, becoming enveloped in the aggressive conflict. From the sun-scarred plains of Mercury to the frigid vacuum of the Outer Rim, battles rage across the Solar System, some fought in the open with ships and soldiers, some fought in secret with spies and assassins. For now, the factions seem evenly matched, but no one knows how long that will last. A handful of determined people might change the tide, a few actions might determine the face of the Solar System for millennia to come.